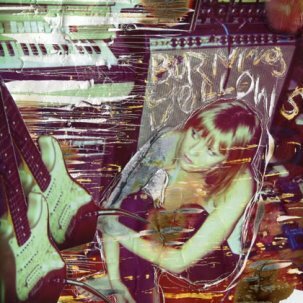 Portland, OR has been home to quite a few great bands in recent years (and has ever since the 70s, as evidenced by the 10-29-79 compilation, and the Northwest Passage film), and we're beyond excited to offer the debut single from our first band from the area, the sublime and apparitional Burning Yellows. From the second the heartbeat metronome fades in on the first song, an atmospheric VU-rhythmic throb encapsulates your senses and lures you into their reverberated world, and vocalist Kyja's echo-saturated vocals wash over you like a chemical bath stripping away your metaphorical outer layer of dead skin. As the band evolved from its primordial state and into the live arena recently, look for Burning Yellows to continued to daze and mesmerize onlookers with their dreamy, fuzz-laden pop vibrations that will leave you glassy-eyed and converted within minutes. First 200 copies are Gold editions, wrapped in an elegant 'Oceanic Nightmare' alternate sleeve.